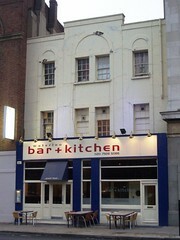 The Waterloo Bar & Kitchen was a brasserie-style restaurant in Waterloo, serving modern British cuisine. It has now closed. According to a thread on the LondonSE1 forum, the premises were repossessed by the landlords in January 2019. Brasserie-style restaurant in Waterloo, serving modern British cuisine. It's right next to the Old Vic — very handy for a pre-theatre bite. You can reserve a table via the website (no confirmation phone calls involved either). Brunch is served on weekend mornings, and on Sundays they serve roast dinners. The exterior doesn't look particularly promising but it's tastefully decorated inside, with banquette seating and large tables (if not a huge amount of space to walk round them). On Kat's Thursday evening visit in August 2015 it was almost full at 7.30pm, with clientele who looked like they might have been going to the theatre, except there wasn't actually anything showing that evening. We unintentionally opted for all-aquatic starters and mains: Brixham crab (£8) had a lovely flavour but the accompanying crostini were tiny and almost tooth-chippingly hard. Gravadlax (£8) with pickled cucumber went down well. Mum enjoyed her Thai-spiced Sea Bream with coconut rice (£17), which had a decent kick to it. Roast cod (£16) was also fine but didn't come with enough carbohydrate for Dad's liking. Salmon fishcakes with fries (£14) were satisfying if not particularly memorable, but the accompanying fries (served in a mini frying basket) were perfectly crispy. Desserts (all £6) were mixed: cheesecake was disappointingly cotton-wool-like but the tart tatin and chocolate brownie weren't bad at all. The wine selection looked pretty good, with a fair number of by-the-glass options. A perfectly decent bottle of Sancerre was £25. Service was helpful but a little inattentive — we asked twice for some more tap water near the end of the meal, but it never arrived. 3 courses plus wine and service came to around £42/head. Kat's verdict: my parents enjoyed the food but found the ambience a little too noisy. While the food was good quality, it still felt quite expensive overall. I'd return if there was a lunch deal or similar though. Accessibility: Toilets are up a reasonably steep flight of stairs with a hand rail on one side, and a turn halfway up. The ground floor dining area is all on one level. Last visited by Kat and parents, August 2015. Last edited 2019-02-04 19:16:53 (version 5; diff). List all versions. Page last edited 2019-02-04 19:16:53 (version 5).